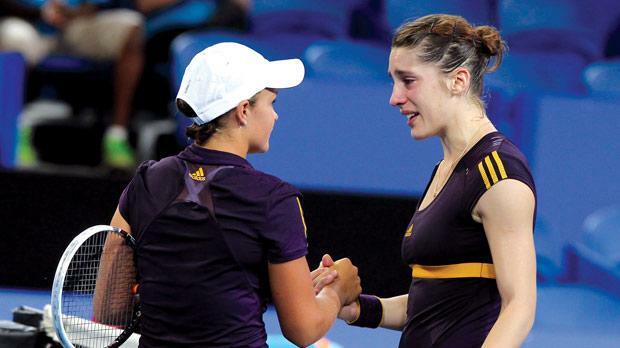 A tearful Andrea Petkovic (right) shakes hands with Ashleigh Barty in Perth yesterday. Andrea Petkovic’s 2013 campaign has suffered a potentially catastrophic setback before the new year has even begun, with the German struck down by a knee injury at the mixed teams Hopman Cup yesterday. The injury-plagued Petkovic appeared hampered by a right knee problem late in the opening stanza of her singles match against Australian teenager Ashleigh Barty, but still managed to win the first set 6-4. The former top 10 player sought treatment at the end of the first set and broke down in tears while being attended by the trainer. With her right knee heavily strapped she returned to the court, but the 25-year-old did not even manage to play another point, instead retiring from the match in tears, throwing her upcoming Australian Open campaign into serious doubt. Petkovic had been ranked as high as ninth in the world in 2011, but slipped outside the top 100 this year due to injuries, with back and ankle problems seeing her end the year at 126 in the rankings after playing just 23 matches for the season. She had surgery on a torn anterior cruciate ligament in her right knee in 2008 and last year tore the meniscus in the same knee. Her retirement handed Australia a 3-0 win in the Group A tie, with the Germans forfeiting the mixed doubles and Bernard Tomic earlier beating Tommy Haas in three sets. Earlier on the opening day, the Spanish pairing of Anabel Medina Garrigues and Fernando Verdasco notched a 2-1 win over South Africa in sweltering heat. The singles rubbers were split in the Group B tie, with Medina Garrigues beating Chanelle Scheepers and Kevin Anderson upsetting Verdasco before the Spaniards proved too strong in the deciding mixed doubles. The fourth seeds for the eight-nation tournament, Verdasco and Medina Garrigues, won the doubles in a match tiebreak, 6-4, 6-7 (3/7), 10-8 on a day where the mercury reached 40C (104F).